Gracie has a special star. It shines and sparkles in the night-sky just for her. Each morning she says, “I wish you were here with me all the time.” So one evening she takes the star and brings it home. Out of context the star is grey and dull and lifeless and no amount of effort on Gracie’s part can renew its sparkle. She tries dressing up in her starry dress and dancing. She thinks the star needs some friends so she places it in a rock pool amongst the starfish. No matter how hard she tries to please the star she cannot make it shine. Gracie comes to realise that it would never shine for her again…until she learns to let the star go. Karin’s beautiful illustrations, rich poetic text and affecting theme make this picture book sparkle. I can’t wait to read this story aloud to a group of children. This sounds very appealing. 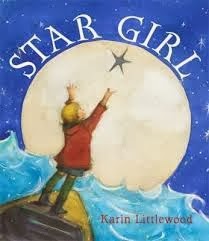 And good to see Karin Littlewood's name. She illustrated one of my books back in the 1980s with some lovely cat drawings. Sounds a delight of a picture book, Lynda.